The Community Council for Australia (CCA) says not-for-profits and charities must resist any attempts to erode their power to advocate for change, because community-minded groups taking their mission seriously need to use every tool they have to achieve those goals. The CCA sees itself as an independent and non-political organisation building the capacity of the sector, but in recent times the council's chief executive, David Crosbie, has been outspoken in defending the right of groups to criticise governments and others, saying it is a crucial part of their role. Our Community quizzed him about how he sees the current state of play. Shouldn't charitable activity and advocacy be considered different things? No. Most charities start out as disruptors - seeking to provide something in the community that is missing, such as blankets for the homeless. Most go on fulfilling this goal (to make the homeless warmer) quite happily - often for years. But at some point, some charities might ask why they are seeing the same homeless people night after night, month after month. Maybe just providing blankets is not enough? Maybe they should try and get them shelter? And so they move from what might be termed charitable service provision (blankets) to charitable advocacy - they become advocates for the provision of more shelter for the homeless. Let me give you another example. A local environmental group might spend months cleaning up a stream, often picking up all the dead fish and removing them. At some point they might ask why the fish are dying, what the poison is, and how it is getting into the stream. When they find that a factory upstream is dumping chemicals into the stream, they are almost certain to become advocates for restricting the dumping of chemicals into the stream. It is almost inconceivable to me that a charity pursuing its purpose does not engage in some form of advocacy at some level. If not-for-profits lose that power of advocacy, what would this look like? A mess. No-one advocating for changes that would improve our communities or protect the most vulnerable … Almost inconceivable. You say not-for-profits are the heart of our democracy. Why is that? Charities are supported by their communities to pursue their charitable purpose. They are a collective expression of what matters to communities of people, often representing issues of concern to people who do not have the power to influence political decision making. They are a bastion of equality that helps diminish the capacity for the most economically powerful to completely dominate policy making. Why do you see advocacy by not-for-profits and charities as being under threat? Some parts of government are opposed to charities being able to advocate at all. They do not like charities criticising them for their policies in areas like the environment, welfare, education, health, housing, employment, indigenous affairs, the arts, animal welfare, etc. This anti-charity perspective is reflected in legislation before the Parliament at the moment, about foreign donations. It also has resonance with the appointment of an anti-charities crusader to the role of ACNC commissioner, and the terms of reference for the ACNC review that focuses most on enforcement. Concerned charities are starting to work together in opposing these measures. 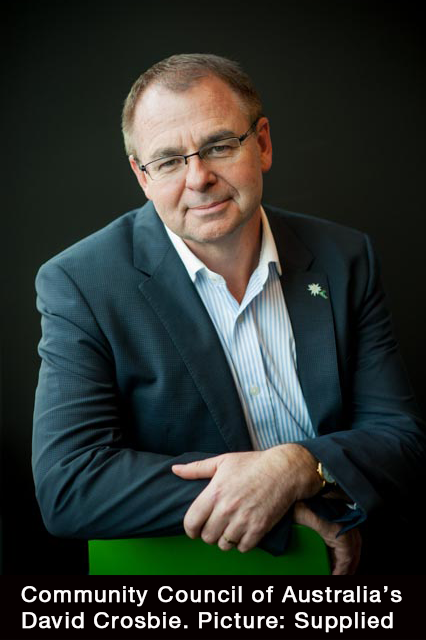 Shouldn't not-for-profits accept the new environment of greater accountability, including to their donors, as the new ACNC commissioner, Gary Johns, suggests? Charities are happy to be accountable and open to scrutiny - that is why so many supported the establishment of the charities regulator. Charities are not happy to have government restricting their role and their voice on behalf of their cause or their community. Charities are already restricted: they cannot donate to political parties, cannot support a particular candidate, cannot support a particular political party, cannot hand out how-to-vote cards. Moves to impose further restrictions and clamp down on the voice of charities have labelled charities that have spoken out against government policy as being problematic. They have used terms like "charities interfering in the political process". If a charity like the Australian Conservation Foundation speaks out on behalf of its 400,000 supporters against government policy, they are reflecting exactly what their donors want them to do, and advocating on behalf of their charitable purpose. People can disagree, or can agree, and they can vote for whoever they like. This is what democracy is. Silencing the voice of groups like ACF diminishes our political process and undermines democracy. Charities raising their issues is a healthy part of our democracy. I think anyone concerned about democracy in Australia should be more concerned about the very powerful vested interests who can, and do, influence politicians and public policy without any scrutiny or accountability. Very few charities can afford to fly the foreign minister and the deputy prime minister to a private wedding in India with a few of her mining magnate mates. How would you describe the performance of community groups and not-for-profits in the past year when it comes to advocacy? Not as strong as I would like. If we are going to build the kind of Australia we want to live in, the charities sector needs to play a much more active role in public policy. Can you highlight effective campaigns of the past year? 2017 saw the government finally accept that the ACNC had a useful role and should not be dismantled. Until then, there was no certainty for the ACNC and for the sector about regulation into the future. This article appears in Our Community Matters. Tap here for the latest edition.